Build dynamic, cross-browser Web applications with PHP--the server-side programming language that's taken the Internet by storm. Through detailed explanations and downloadable code examples, this comprehensive guide shows you, step-by-step, how to configure PHP, create PHP-enabled Web pages, and put every advanced development tool to work. 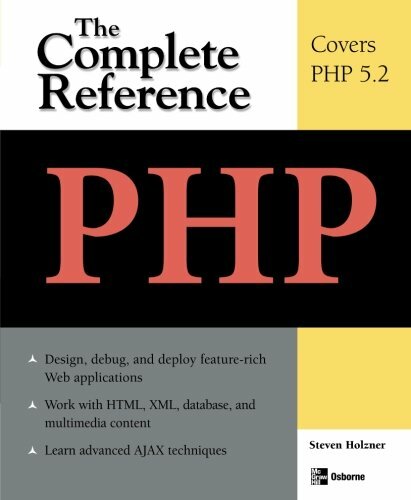 PHP: The Complete Reference explains how to personalize the PHP work space, define operators and variables, manipulate strings and arrays, deploy HTML forms and buttons, and process user input. You'll learn how to access database information, track client-side preferences using cookies, execute FTP and e-mail transactions, and publish your applications to the Web. You'll also get in-depth coverage of PHP's next-generation Web 2.0 design features, including AJAX, XML, and RSS.